A haven of peace & tranquility, located on a much sought after Residential Community, this beautiful property offers an exceptional retreat with five star quality, comfort & facilities. 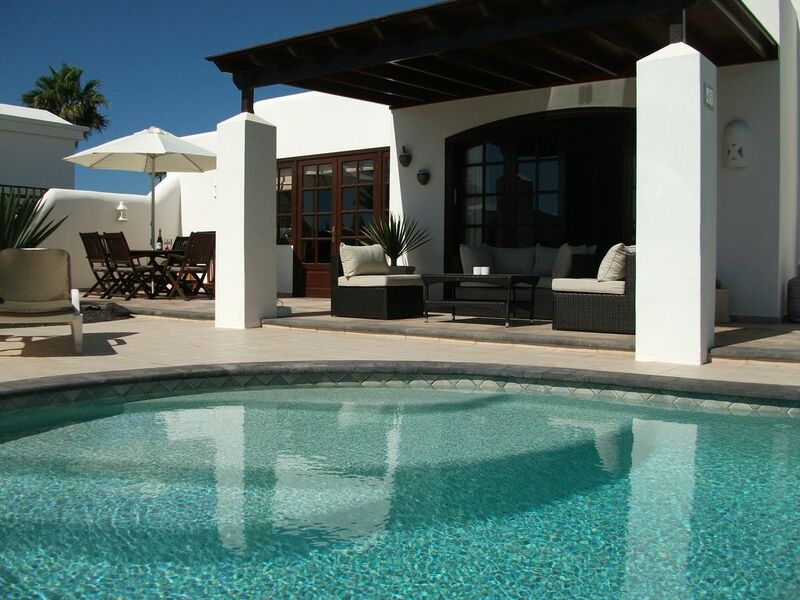 A true home from home villa in which to relax and unwind under the glorious Lanzarote sunshine. It is preferred that all guests are aged 40+ due to the quality of fixtures and fittings provided. The villa is unsuitable for children and younger generation adults. The property has been uniquely tailored to offer the ultimate in luxury, with 3 large double bedrooms complete with comfortable Tempur mattresses, 2 marble finished bathrooms (1 en-suite), large spacious lounge with reclining leather sofas, high speed 10mb Wi-fi included, flat screen TV with full package of UK channels and movies, DVD player along with a selection of DVD´s for those quiet, cosy evenings indoors, a bespoke fully equipped fitted kitchen with built in applicances, including dishwasher and microwave, tassimo coffee machine with complimentary capsules provided, a large utility room housing a modern American Fridge Freezer supplying constant ice and freshly filtered chilled water (alleviating the need to purchase and carry heavy bottled water and ice!! ), a large sizeable dining room with double french style opening doors which lead out onto the beautifully manicured cactus gardens, enhanced during the evening with subtle LED lighting. For those wishing to enjoy year round "Al Fresco" dining, there is a large outdoor area complete with hardwood table and padded chairs along with a 4 burner Gas BBQ (fuel included). Under the wooden pergola you will find a shaded seating area complete with comfy padded sofa and chairs....ideal for relaxing with a good book (or glass of wine!!). There are extensive terrace and patio areas surrounding the stunning 10m x 5m individually designed, solar heated swimming pool, ample relaxer style sunbeds with padded covers, large pool towels are supplied for each guest. For added relaxation, an invigorating 6 person Jacuzzi/Hot tub at a constant 38 degrees, can be found surrounded by a screened area of pretty Bougainvillea plants. A complimentary Welcome Pack complete with Chilled Cava and Cold Beers will be awaiting your arrival!! Casa Palana is available year round. The owners, having lived and worked on the island for over 14 years, find that their experience within the tourism sector has proven that the middle aged and retired generation of tourists are looking for a better quality and standard in their villa rental, especially for those wishing to escape the cold winters of their homelands and stay for an extended period. For those looking at a longer duration stay (over 3 weeks), pricing may be negotiable subject to guest requirements. With several local cafes, bars, restaurants and two well stocked supermarkets within a 2 minute walk of the property, this is the ideal location for those looking for peace and relaxation with amenities close by. The owners can offer a private taxi transfer service to and from the airport (subject to availabiliity) for those guests not wishing to use car hire. My wife and I along with our daughter have lived on the island of Lanzarote for over 14 years. We have worked within the hospitality industry since emigrating from the UK and now offer our own property as part of our Villa Management Agency, More Sun Villas. As owners and managers of Casa Palana, we assure all guests of the best in quality, comfort and cleanliness along with the personal touches and friendly customer service, lacking in so many of the rental properties now available. All maintainence, cleaning and customer liaison is dealt with personally by the owners who live and work locally and therefore you are not left in the hands of cleaning companies or large agencies. This gives guests the reassurance of knowing owners are on hand to deal direct and ensure the smooth process from booking to arrival. All bedrooms have full screen fitted mosquito nets to shutters - this means windows can be left open, fully secure during the evening to aid in ventilation and the flow of cool air. The villa is specifically built to retain the cool air during the hotter summer months and with the addition of fans in all bedrooms, you are assured of a comfortable, restful evening sleep. Marble tiled bathrooms with quality chrome fittings. Hand wash in ceramic pump dispensers is provided in each bathroom. Portable heaters are available for guest use should they be required during cooler periods. 10 MB high speed internet included in your rental price - no added extras! Comfortable leather reclining sofas and chair with support cushions. Locally designed solid hard wood furniture including coffee and side tables. A welcome pack is provided for your arrival - water, milk, tea, coffee, sugar, biscuits, crisps, coffee machine capsules, bottle chilled cava and tinned beers. Music/radio all part of TV package....many channels. IPOD and docking station available for guest use. Beautifully maintained Cactus gardens surround the property and terrace areas with subtle LED lighting during the evening. Large tiled terrace areas surround the pool, incorporating relaxer sunbeds and padded cushions - the upper terrace has a hardwood dining table, large parasol and padded seating for up to 6 people. There is a small step to the front entrance access door with the interior of the villa then being on one level. A very low step is then located on the outside terrace taking you to the pool area. Access to pool is via 3 very large gradient steps with a shelved seating area located in the deeper end. The Faro Park community has its own Communal Swimming Pool soley for residents and guests use. This is located in the centre of the community and has an access key which can be found inside the villa. Thank you for your kind comments. It was our pleasure to have you as our guests and we do hope to see you again soon!! We have just come to the end of an 8 week stay in Casa Palana, our second stay in this comfortable villa during the past twelve months. It’s a very quiet and peaceful place to escape to from the English winter. As was the case during our last stay here this villa ticks all the right boxes to ensure an enjoyable, leisurely holiday. There are a good selection of bars and restaurants to visit in the evening, and all no more than 5 minutes walk away. Our only complaint is we have had to give the door key back to Cerys and Paul at the end of our stay, but only until next winter when we are booked to return. It is a pleasure to have you as guests and to know that our villa is being well looked after during your time with us. We are delighted that you have enjoyed your stay and look forward to welcoming your back again next year for your third visit!! Seasons Greetings and our best wises for 2019....see you in November!! Beautiful property with everything you could possibly need to enhance your holiday . Many thanks for your review and kind comments. We strive to ensure all of our guests receive the best in service, comfort and cleanliness and it is always lovely to hear that our efforts are appreciated. We look forward to seeing you both again soon. The property is exactly as described and as per the photos on this site. It is highly maintained by the owners to a top standard. Paul and Cerys are excellent hosts from start to finish, who are on hand for any issues, no matter how small and will ensure you'll have an amazing holiday. Many thanks for taking the time to write a review....much appreciated. We are delighted that you enjoyed your time at Casa Palana and hope to welcome you back again in the not too distant future. We have just returned from a fabulous holiday at Casa Palana, and we honestly couldn't recommend this villa enough. We travelled in a group of 3, and found the villa was perfect for our ideal holiday scenario. From the moment we made the booking, Cerys provided first class customer service - quick responses, lots of info, and exceeded our expectations with the detail in her answers to our many questions. We opted to book the taxi service that Cerys and Paul provide, and Paul was very friendly and informative about the local area. Paul came to check on the pool and hot tub over the week which never felt intrusive - more like an old friend turning up for a chat every now and again! The villa is lovely - the interior is immaculate and the beds very comfortable; we loved the big fridge that provides ice and water, and found this to be a real bonus. We took coffee pods with us, and found the coffee machine very easy to use - a perfect accompaniment to the great croissants sold at the local bakery (Moka). The pool is simply gorgeous and we loved the seat at the deeper end. We enjoyed a nightly hot tub with a glass of fizz (a real touch of luxury! ), and really liked the way this was slightly secluded. There is a row of bars and restaurants a 5 min walk away, although to be honest we were very happy to use the BBQ and make the most of the villa. The off licence there is a real find, with cold bottles of cava and beer for very reasonable prices (under 6 EUR for a bottle of Frexinet certainly put a smile on our faces). We walked into Playa Blanca along the coastal road, which was very pretty, and went to Marina Rubicon several times. We also used the very reliable bus service and the local taxi company with no issues at all. Behind the row of restaurants on the front at Playa Blanca is a Spar shop with a fresh meat counter - this is where we ended up buying meat for the BBQs. However for everything else, the supermarket near to the villa was great. All in all, a very relaxing and stress-free holiday at a villa that has great facilities and some very luxurious features - thank you so much Cerys and Paul, we had a great time and hope to come back again soon! Many thanks for your lovely comments, they are much appreciated - we are delighted to hear that you enjoyed your stay, were happy with the services we offer and pleased with the villa and facilities. We always endeavour to ensure guests have a wonderful stay and return home with great holiday memories. We do hope that you'll all come back and see us again soon!! Casa Palana is a very comfortable villa in a quiet residential area. It is maintained to a very high standard by the owners Cerys and Paul. We have just returned from a six week stay, and have booked to return for eight weeks during the same months in 2018. Having spent the last 30yrs holidaying in these types of villas in Lanzarote, Casa Palana will take some beating. Many thanks for taking the time to post your review. We are delighted that you both enjoyed your stay and look forward to welcoming you back next year. There are a wealth of facilities, attractions and excursions on offer both locally and throughout the island. As private owners who manage and maintain the property personally, we will call by to meet and greet all guests and therefore be on hand to answer any questions you may have regarding the island and local area. For those loving a beautiful sunset, the seafront is merely a 2 minute walk from the villa where you will find a rugged, rocky shoreline along with a paved promenade walkway....Ideal for taking a bottle of your favourite tipple, finding a comfy spot (either a shoreline rock or one of the promenade seating areas) and watching the wonderful display of the sun setting into the Atlantic Ocean - a display that the south of this glorious island is famous for. Please Note: Standard weekly price is based on 2 adults sharing one double room. Please add £100 (GBP) per week per additional guest for reservations of more than two people. The property will be prepared as per your booking requirements and rental costs charged accordingly - if your booking is based on 2 adults sharing, this will be on the basis that 2 adults are sharing one double bedroom, unless you specify different sleeping arrangements upon booking. Where a guest wishes to use an additional bed (we understand and will cater for differing needs) an additional cost of 25 GBP per additional bed, per week will be incurred. All bookings over 9 nights+ will be provided with a mid stay linen and towel change along with a refresh and clean of kitchen and bathroom areas.